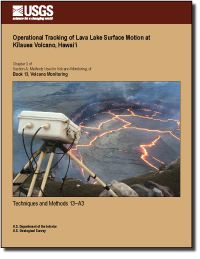 The USGS Hawaiian Volcano Observatory uses a variety of ground- and satellite-based techniques to monitor Hawai‘i’s active volcanoes. Here, an HVO scientist sets up a portable GPS receiver to track surface changes during an island-wide survey of Hawai‘i’s volcanoes. An HVO geologist photographs a small breakout covering the last stretch of exposed asphalt near the intersection of highways 130 and 137, just west of the current County lava viewing area. 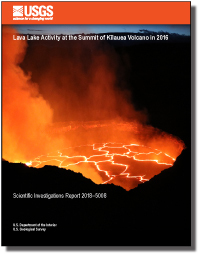 The WorldView-3 satellite acquired this view of Kīlauea's summit on July 3. Despite a few clouds, the area of heaviest fractures in the caldera is clear. Views into the expanding Halema‘uma‘u crater reveal a pit floored by rubble. HVO, on the northwest caldera rim, is labeled.